The Skykomish River is about 1 hour from Seattle. The river starts in the Cascade Mountains and the north and south forks join the main river around Index. It then flows through Gold bar and Sultan prior to joining the Snoqualmie River. This river is surrounded by beautiful scenery so be sure to take that all in as well when you fish this river. That is what fishing in the northwest is all about, well that and river steelhead fishing! From Sultan downstream the river gets wider, easier to navigate and plenty of room for casting. Upstream from Sultan and Gold Bar the river is narrower and faster with deep pools and boulders. This section of the Skykomish produces all year but it is best when the water level is lower. Many people fish this river from a boat, but there are good spots to wade also, or to get out of the boat to wade. This river is a great fly-fishing river and it is best known for the Steelhead fishing. In the fall Pink Salmon and Silver Salmon fill the river and provide great fly-fishing. The Steelhead start to hit the river in December and continue to thrive through February. There are lots of river fishing guides available to help you have a great day fly fishing. The summer runs of Steelhead are from June through October. This is not a trout stream, it is the Steelhead that brings anglers here from all over the northwest. The chance to catch a 15 pound or great fish and give you bragging rights over your friends. This photo is courtesy of Troutnut.com. 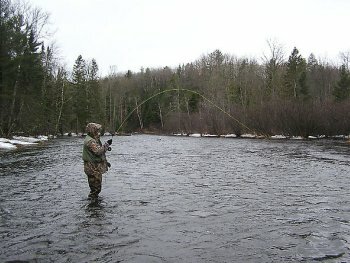 Although there is a nice summer run of Steelhead this river gets fished mostly during the winter months. This is another river that would be best fished at least on the first time with a guide. You will need to use a spey rod and most guides will have these if you don't. Be sure to bring your camera so you can get a nice photo of these large Steelhead once you have landed one. Map of the Skykomish River. Leave the Skykomish River and return to the Washington page.